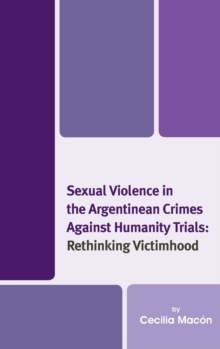 The origin of Sexual Violence in the Argentinean Crimes against Humanity Trials: Rethinking Victimhood can be found in the resistance that, using a traditional feminist perspective, alleges that testimonies of sexual violence in the context of Argentinian crimes against humanity trials inevitably re-victimize victims. It is our understanding that such interpretation not only forgets to pay attention to what victims have to say about their experiences but also bases its allegation on dualistic and patronizing conceptions of female agency. 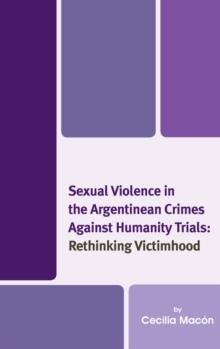 This book argues that the role of affect in the experiences of those women who decided to testify as well of those who refused to do it shows to be a useful tool in order to analyze the sexual violence issue from a thought-provoking and heterodox perspective. Cecilia Macon presents her argument through philosophical debates paired with testimonies of victims and analysis of works of art devoted to express these problems. Recommended for scholars of Latin American studies, philosophy, history, and sociology.